also a Memphian showed versatility on the part of the BAR-KAYS and especially the vocal capibilities of lead singer Larry Dodson. “WE CANT STAY TOGETHER” (Featuring SHIRLEY BROWN) was the lead song from their new full length cd and it took radio by storm. It is sure to gain a brand new audience for The Bar-kays. Larry and James have also launched their gospel label, Testimony Records, with the signing of the internationally known “Billy Rivers and The Angelic Voices of Faith” “Perfection”and “Apostle Bill Adkins.” The Bar-kays’ ‘HOUSE PARTY” CD was released February 27, 2007 and rose to #32 on R&R.Thier new album “ is Scheduled for a fall 2014 release and their last cd single “RETURN Of The Mack” made huge waves at radio and “GROWN FOLKS” their last singles, produced by JAZZE PHA released JULY 31, 2013 proved to be a smash at radio and rose to a top 10 single on the urban ac charts and climbed the top 100 pop charts. It was the first release from the group’s 30th career album which features collaborations with iconic artist and producers like JAZZE PHA, GEORGE CLINTON, DOUG E. FRESH, 3 6 MAFIA , EIGHT BALL and MJG and a host of others ,yet further proof that the legend continues. The Bar-kays are well on their way insuring themselves another decade of great music for their many fans with their soon to be released new single on their own JEA RIGHT NOW RECORD label. The new single ‘UP AND DOWN” once again features the warm , smooth romantic vocals of Larry Dodson with a surprise duet twist from anew female artist Latrese, as well as all of the expected BAR-KAY musical signatures, but the BAR-KAYS have seemingly struck a new nerve with thier old and new fans with this fresh new style they are bringing to radio with their new releases. Its fresh,its happening and most important.. their fans and radio are loving it !!. 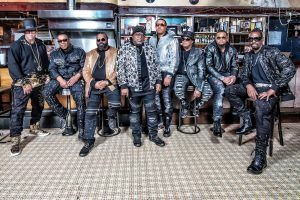 The Bar-kays have once again help to make history as they were honored to be one of the first African American performing artist to perform in Iraq and Kuwait for the American troops fighting there.They performed four shows in Iraq and one show in Kuwait under high security. They were honored to return to Iraq and Kuwait to perform for the troops for the third and last time before they are pulled out for good. The Bar-kays also had the distinct honor of having being asked to perform for President Obama’s inaugural gala in DC and again in 2013 as a part of a special Tribute to Stax records and Memphis music which was taped and aired live from the White house. James and Larry said that it was a life changing experience for both of them.The Bar-kays most recent life story tv special on the popular TV ONE show UNSUNG has been deem by the TV ONE network as the most popular story aired to date by the network, aquiring rave revues and ratings for the network since the network first started the series. This year marks the 50th anniversary of the Bar-kays musical career and will be celebrated throughout the entire 2014 year ending with a spectacular star studded 50th celebration in Memphis ,Tennessee in early December where The Bar-kays have a musical note on beale street and have recently been inducted into the Memphis Music Rock and Roll Hall Of Fame with such music icons as Albert King David Porter Carla Thomas Kirk Whalum and a selected few. They were inducted into the R&B hall of fame on June 14, 2015 with such legends as little Richard, Millie Jackson , Stax Records, AL Bell and actor Morgan Freeman, It is safe to say that the Bar-kays have more to say and indeed much more music to give the world before its over as James and Larry often say as both of their books will be finished in 2015 and it is also safe to say……………………….THE LEGEND CONTINUES.